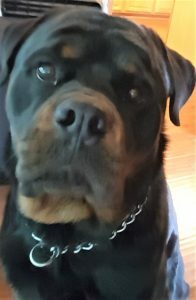 Rottweilers are in the top ten dog breeds for intelligence. Sometimes we forget that when Tor runs into a wall or gets scared by a leaf. Recently we had some struggles with him doing what he is supposed to do. He will ask to go outside (by ringing the bells on the door) and then refuse to go out. Erik asked him, “outside or crate?” Tor immediately went outside. Now we offer the crate when he doesn't comply, and he almost always chooses the right thing. He still runs into walls and barks at leaves.